Parting Ways: Navigating Family After Parents Separate | Features | Kids VT - small people, big ideas! The decision to leave my partner didn't come after one massive fight. And if our separation was waiting in the wings, I wasn't aware of it. Just last year we were raising a then-2-year-old, all bubbly, inquisitive and joyful, and had entered the summer with ambitions of sharing our love of the outdoors with her. We bought a canoe and planned family getaways. But trouble was lurking just below the surface. 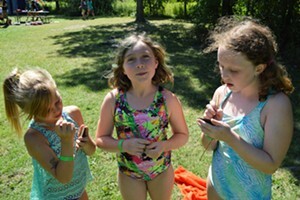 We'd gone to three different counselors in our four-year partnership and couldn't seem to escape our cyclical problems. I was in a fundamentally unhappy place and needed to get out. I spent a few days reviewing our finances to see if I could afford an apartment before I told my partner, through sobs, that I thought I had to leave him. His response dealt the deathblow to our relationship: "I'm not going to fight for this." Though we considered ourselves married, and even had a celebration for our partnership, we were in an unmarried union that produced a child. According to state data, situations like ours are not uncommon. More than 2,000 Vermont families break up each year, according to filings in family court, and the number of those families involving unmarried parents is on the rise. In fiscal year 2015, half of family court cases related to child support and custody involved unmarried couples, up from 45 percent in FY 2011. Court documents represent only the first step in a long and complicated process. Logistically, it's not easy to separate when everything from car payments to childcare tuition is intertwined with another caregiver. As a newly single parent, I found support hard to come by. A year after my separation, I still sometimes feel like I'm starting over. But by sharing a piece of my story, I hope to offer insight on what's out there for other separating parents — and to let them know they are not alone. Transitioning from one household to two is like trying to organize a funeral while grieving a painful loss — only the process is prolonged. Figuring out who will live where can be complex. 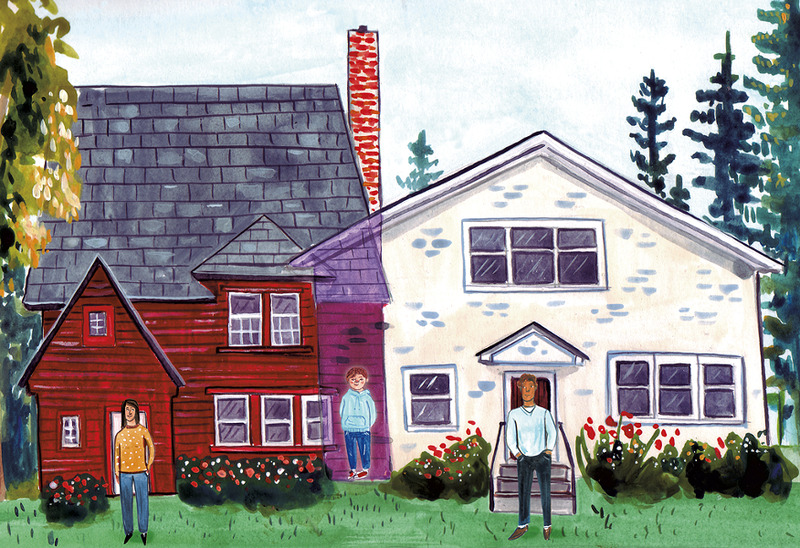 In Vermont, high housing prices and low wages complicate matters. At first, my ex moved into the basement of our house and we made it work for the month it took me to find a place I could afford. I had been the breadwinner but, because I initiated our breakup, felt I should be the one to move out. I prepared my daughter weeks in advance by telling her at bedtime that I was going to be living in a different home, to which she would quietly nod and agree. Now, when I ask her how she felt back then, she says, bluntly, "Sad." She also expressed that it didn't make sense to her until she saw my apartment. When I moved, we divided up our nights. Online research suggested that younger children want more frequent contact with both parents, so we tried to keep an every-other-day schedule, which was chaotic. After starting mediation we tried a 2-2-3 schedule: one parent has two nights; the next parent two; and the first parent, three. Then it flips. Melissa, a divorced mom from Richmond, recalled how she and her ex shared custody of their young children right after the split, while he was living with friends. "He would take them after school and bring them home [to her house] for bath and bed," she said. When he later moved in with a family friend, he had them 50-50 for overnights, and they kept custody shared. Four years later, he lives two hours away and takes the now 7- and 10-year-olds three weekends a month. Sometimes parents choose to reserve the family home for whoever is with the children, an arrangement known as "bird's nest custody." My ex and I decided against that option because, in order to afford it, we'd have to share the non-nest home, and we felt our unresolved arguments would follow us there. I found an affordable two-story apartment with two bedrooms and a deck that was just a mile from the house my ex and I purchased together. Anxious as I was to introduce my toddler to my new home, I was heartened to hear her bragging to a visiting friend on her first night in the apartment: "This is my mommy's house. Didn't you know? She has her own house." She was more convinced than I that the shabby flat was a home. Couples who need help solving the living-arrangement puzzle — or just talking with each other — can use a mediator. Mediators act as neutral facilitators in finding agreement on everything from kids' schedules to dealing with debt. And in Vermont, many will help couples write their parental rights and responsibilities form (also called parental stipulation) — the legal document outlining the parameters of the parent-child contact. Winooski-based divorce mediator Susan Fay recommends seeking outside assistance, and the earlier, the better. Without a neutral person to help them sort through things, she said, "most people get very entrenched in their sense of right and wrong. And they get entrenched in their anger." The Vermont Superior Court Family Mediation Program mandates that couples in high-conflict cases attend mediation. But parents who don't fit this classification can use the program to find a mediator as well. Ours was dogged about staying neutral within our sessions yet allowed us each to vent beforehand about anything that might have prevented us from keeping an open mind. Enabled by the presence of a third, unrelated party, my ex and I were able to create a dedicated space and time when it was safe for us to talk about anything. 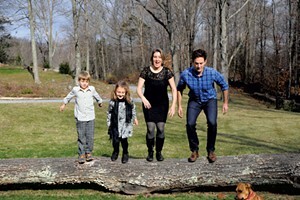 In Vermont, courts also require divorcing parents entering the filing process to take a four-hour class developed by University of Vermont professors called Coping with Separation and Divorce (COPE). It's designed to help improve communication and offer parents insight into how to best serve their children through the separation process. Fay helped develop the COPE curriculum at UVM Extension in 1993. Only divorcing couples are required by law to attend COPE, but the class is available to those in unmarried separations as well. My ex and I were told about COPE by a counselor, and finally went when our mediation hit a standstill. At that point, our communication was limited to texts or emails related to practical issues like pickups or drop-offs. The class suggested waiting a year after the split to introduce children to a new partner, or after six months of dating (to avoid furthering instability); to have the same message and wording to explain your breakup and have a group conversation with the whole family; to avoid bad-mouthing the other parent in front of the child; and to keep a frequent and consistent presence in the child's life. After we absorbed the lessons of the course separately, communication got easier. We both heard the message: Your child's needs come first. One constant theme in COPE was that staying mum about what's happening isn't a great policy. Sarah Oemcke, a licensed clinical mental health counselor and art therapist, explained that kids make their own assumptions. "The kids absorb the feeling and the mood of what's happening in their environment. Even if they might not be exhibiting distress, they most likely are trying to figure things out," she said. "And if they're left to their own devices as kids, they're most likely going to be wrong." "I always say honesty is the best policy," she added. "Honestly you're not going to talk to your 3-year-old about Daddy cheated. It's: What can they understand? And how can they get that this is not their fault?" Fay said one of the biggest stumbling blocks in amicable negotiations is deciding how to share physical custody of a child, noting that past resentment about the division of duties in chores, childcare and planning, or perceived financial strain often come into play. My partner and I agreed to a 50-50 physical share on our own, but there were many times when we couldn't communicate verbally without becoming hostile. To avoid any confusion, we decided to use Google Calendar to organize pickups and drop-offs and any special needs, like field trips and haircuts. When stress levels rise, we default to email and text communication. For ideas, we polled friends who'd been raised by divorced parents for scheduling tactics that worked. Websites like Parents and Custody X Change can help in finding schedules that work best for the age of your kids. Despite the drama we brought to our sessions (I stormed out on one of them), our mediator kept praising us for our "commitment to work together." Misplaced as her kudos felt to me, she repeated the mantra that everyone from case managers to children's therapists seem to agree on: If a judge has to make the decision about your share of the physical responsibility, nobody will be happy with the results. It seems that any time I'm around mutual friends of my ex, I feel overwhelmed by how awry things went. Like the time last summer when I burst out crying at a friend's barbecue because the clutch of toddlers running around made me acutely aware that my daughter was with her dad. With separation, grieving seems to be an ongoing process. COPE's instructors were clear that when parents separate, everyone, including the children, can suffer stages of grief no different than if there had been a death in the family. However, when it comes to support, there just aren't many local resources. The one support group I found was DivorceCare, a 13-week program run by Essex Alliance Church. The session I attended was all about anger. I wanted so much to love the group, but, as a nonbeliever, I couldn't relate to the scripture-laced videos and Biblical references. I met one mom, Barbara D., at the session I went to. "With all the uncertainty that came out of the whole divorce process," Barbara said, "it's nice to have a structure." After watching a video on passive-aggressive anger, she confessed to feeding her 9-month-old son prunes the night before her ex picks him up. Jeff Hess, a COPE facilitator who does relationship coaching at Milton Family Community Center, said that, 15 years after his divorce, he is still caught off guard sometimes. After their divorce, his first wife remarried. Then, in 2015, she died of cancer, and it was the words on her tombstone that gave him a jolt. "You can imagine how difficult it was to see a stone with my ex-wife and her new husband — with our kids as 'our beloved children' with their dates of birth," Hess said. "I had to basically bite my tongue and look at it and go, 'OK.'" I'm often sad on holidays or during family visits, whether my daughter is there or not. I'm still grieving the loss of the happy family unit I had envisioned, with two parents together giving love to their child. There's no way I could have known what leaving meant, but here's what I discovered: My ex has grown into an amazing father and is capable of being more attentive to our daughter than I ever thought possible. I've also learned that no one else is responsible for my happiness. Statistics show that I'm likely to re-partner within five years, but it's not my priority. Right now, my focus is teaching my daughter self-love and fulfillment — and to lead by example. For more info about the Vermont Family Court Mediation Program, call 828-6551 or visit vermontjudiciary.org/gtc/Family/Mediation.aspx. What do recently separated parents need most? A supportive network of friends and family. If you want to help a recently separated friend, offer to take the kids for a playdate or plan a pizza night, especially when a parent is moving or needs adult time to talk or meet with a mediator. Or shower the family with words of love and support to emphasize that some relationships in the children's lives aren't changing. Or keep a read on what's going on with the family, even if you have mixed feelings about how the relationship ended. What not to do? Opine on the state of the world or the institution of marriage. Shut someone out completely, especially if they have the kids. Disparage a family's decision or circumstance, especially with little ears around. Even when you think you're being supportive, your words might not be. I polled separated men and women about the unwelcome comments they've received from well-meaning friends and family. Take note: If you are even thinking of uttering these phrases, best to keep it to yourself. I just worry about your kids. But he's such a good person. You were the perfect couple. You seemed to get along so well. Why doesn't anything connect for you? I liked her so much! Anything starting with "I remember at your wedding..."
I told you not to marry her. What did you ever see in him, anyway? You're going to work it out and get back together, right? I don't think you should leave him. Who knows what will happen to you? You might get cancer and have to die alone. Just don't become a lesbian. I don't think that's the answer. Every marriage goes through difficult times. I knew she would do this one day. It's immoral to be this honest. Have affairs. My husband and I prayed our way through our troubles. You are making gays and lesbians look bad. Here we are fighting for marriage equality and you are getting a divorce? You're not going to find anyone better than her. But he's such a good parent! That's just not how we did things in my day. Just think how quickly he will get scooped up ... doesn't that make you feel jealous?